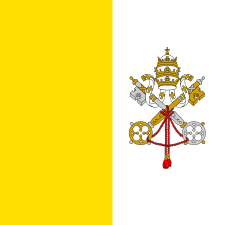 Pope John IX can also refer to Pope John IX of Alexandria. Pope John IX (Latin: Ioannes IX; died January 900) was Pope from January 898 to his death in 900. Little is known about John IX before he became Pope. Born in Tivoli in an unknown year, he was ordained as a Benedictine priest by Pope Formosus. With the support of the powerful House of Spoleto he was elected Pontiff in early 898 following the sudden death of Pope Theodore II. With a view to diminish the violence of faction in Rome, John held several synods in Rome and elsewhere in 898. They not only confirmed the judgment of Pope Theodore II in granting Christian burial to Pope Formosus, but also at a council held at Ravenna decreed that the records of the synod held by Pope Stephen VI which had condemned him should be burned. Re-ordinations were forbidden, and those of the clergy who had been degraded by Stephen were restored to the ranks from which he had deposed them. 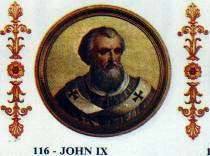 John IX died in the year 900 and was succeeded by Pope Benedict IV (900–903). 1 2 Herbermann, Charles, ed. (1913). 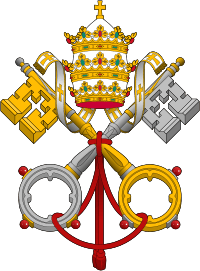 "Pope John IX". Catholic Encyclopedia. New York: Robert Appleton Company. This article incorporates text from a publication now in the public domain: Chisholm, Hugh, ed. (1911). 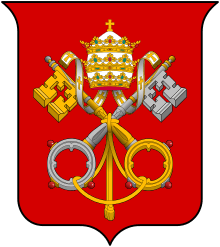 "John IX (pope)". Encyclopædia Britannica (11th ed.). Cambridge University Press. Claudia Gnocchi: Giovanni IX. In: Massimo Bray (ed. ): Enciclopedia dei Papi, Istituto della Enciclopedia Italiana, Vol. 2 (Niccolò I, santo, Sisto IV), Rome, 2000, OCLC 313581688, pp. 52–52. Rudolf Schieffer: Johannes IX in: Lexicon of the Middle Ages (Lexikon des Mittelalters, LexMA). Vol. 5, Artemis & Winkler, Munich/Zurich 1991, ISBN 3-7608-8905-0, Col. 540. Wikimedia Commons has media related to John IX. John IX. In: Salvador Miranda: The Cardinals of the Holy Roman Church, online at fiu.edu, Website of Florida International University, retrieved 5 November 2011.